Morocco will captivate you from the UNESCO World Heritage Site of Fes with its Medersas, Foundouk, palaces, residences, mosques and fountains through to Marrakech, its souks filling the alleys north of the central square, mile after constricted mile of tiny, closet-sized emporia and the elaborate El Bahia Palace. Staying in delightful boutique hotels or sumptuous riads, lovingly restored, you will be thrilled to visit 'In Moroccan Style'. Day 1: Arrive Casablanca Your private car and driver will be waiting for you on arrival to transfer you to the hotel. 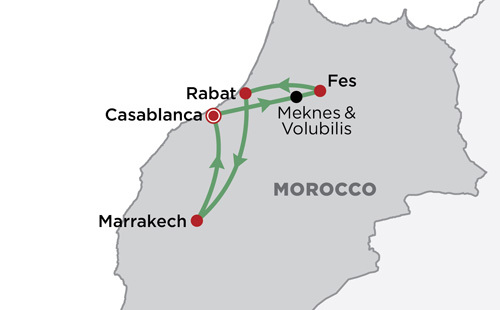 Day 2: Casablanca > Meknes > Volubilis > Fes Depart Casablanca and transfer to Fes. 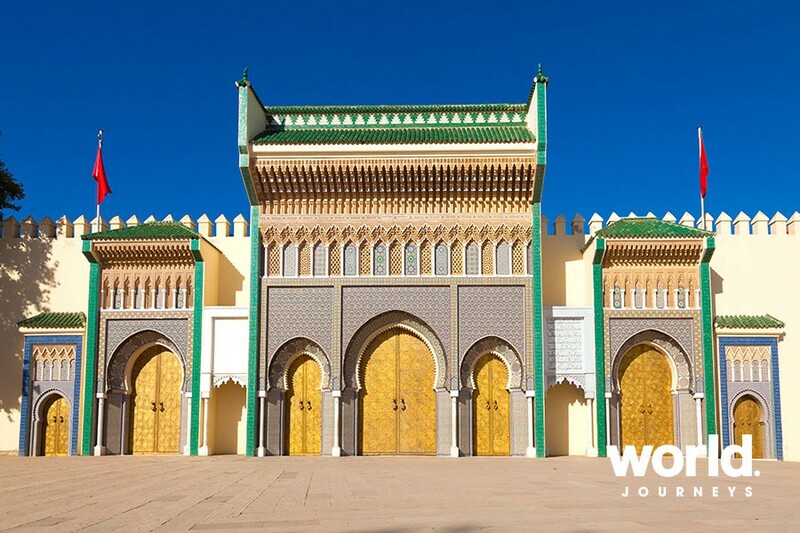 En route visit Meknes, a UNESCO World Heritage Site famous for its 25 mile long walls. In this Imperial city, you will explore the town to include expansive souks and the fascinating historical sites. 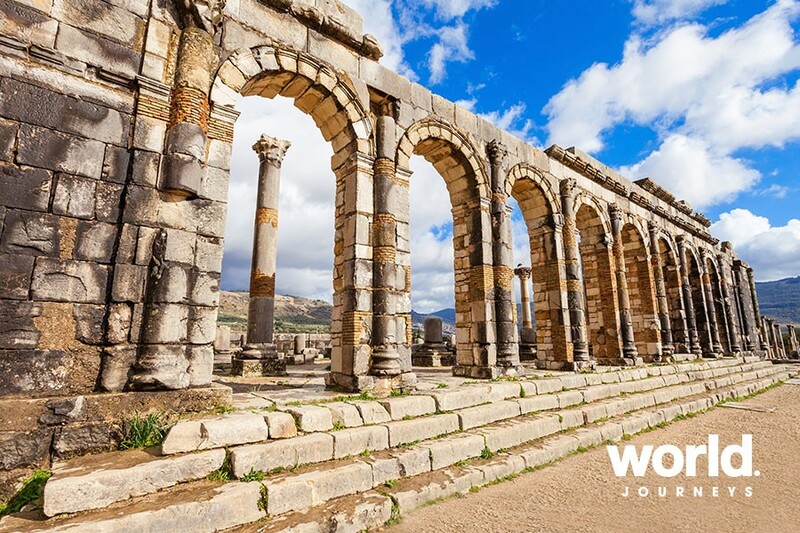 Also visit the World Heritage Site of Volubilis, the site of the largest and best preserved Roman ruins in Morocco, particularly noted for its superb mosaic floors; it has fabulous views of the Rif Mountain foothills. Continue to Fes, arriving late afternoon. Day 3: Fes See the old Medina, Medersa, Bab Boujloud and Souks. 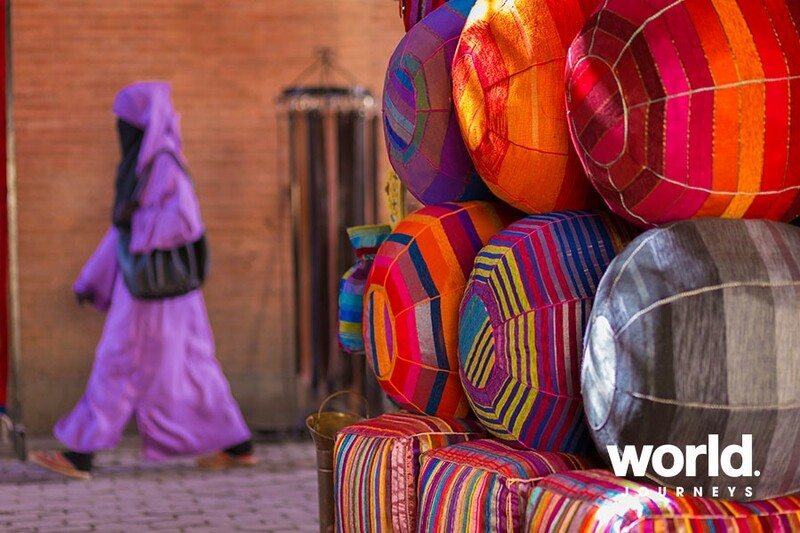 Artisan workshops in the medina are as active today as 100 years ago and strongly contribute to the city's industrial economy. Trades such as metal and leather working, ceramics, silk, tapestries, and sculpting are still practiced in these workshops. Original ramparts still protect the ancient city and its 9000 passageways and narrow streets. 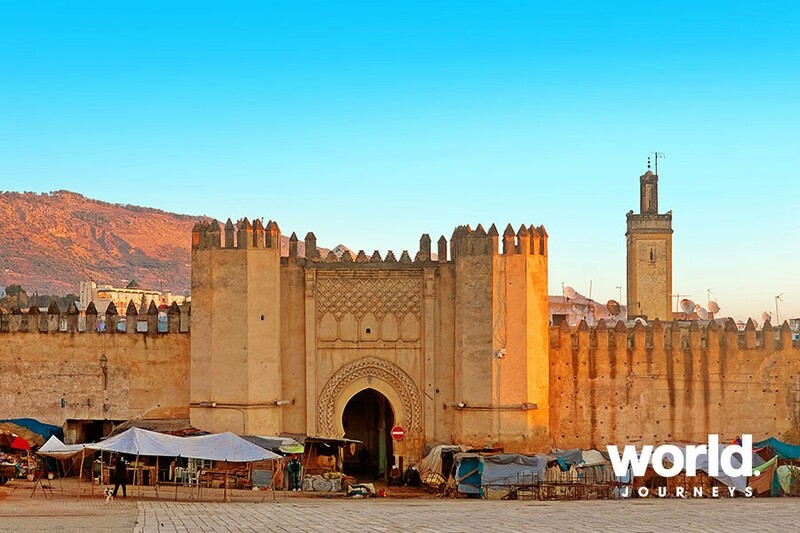 Day 4: Fes > Rabat Depart Fes this morning and head for Rabat where you will overnight. This afternoon visit the Mohamed V Mausoleum before an evening at leisure. 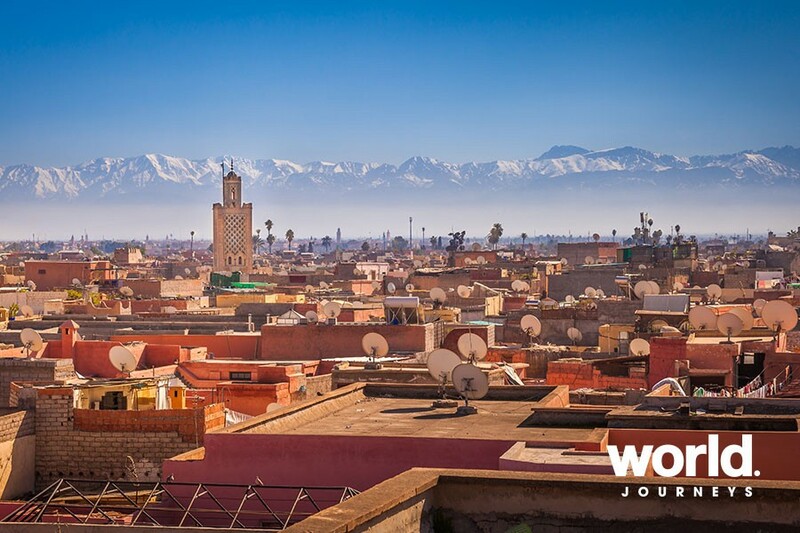 Day 5: Rabat > Marrakech Depart Rabat this morning and head towards Marrakech. On arrival check in to your hotel. The evening is at leisure. Day 6: Marrakech Visit Koutoubia Minaret and Mosque, Tombs of Saadian, Menara Gardens, Bahia Palace and Jemaa el Fna Square. The sheer number of shops in the souk is overwhelming, sometimes 100 of them in 100 metres. Every section of the souk has its own specialty, with alleys devoted to everything from spices and ironwork to the ingredients necessary for casting magic spells! Day 7: Marrakech At leisure. 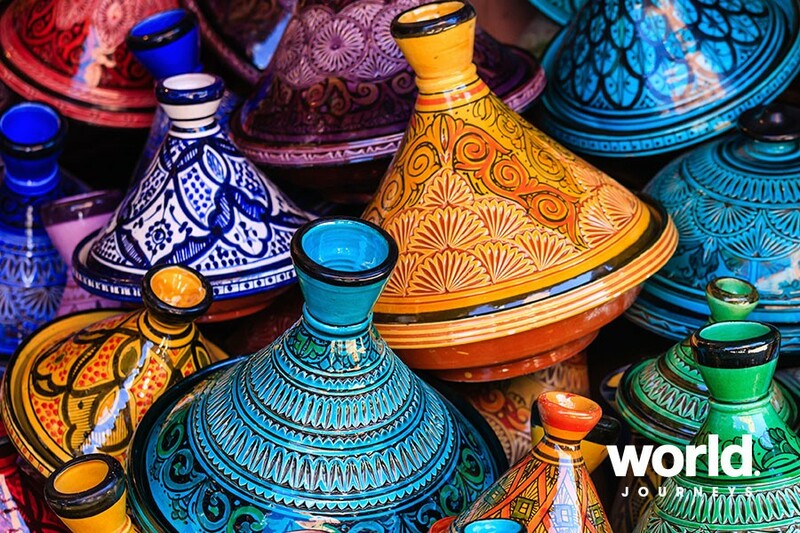 Day 8: Marrakech > Casablanca Transfer by road (3 hours) to Casablanca in time to connect to your onward flight. 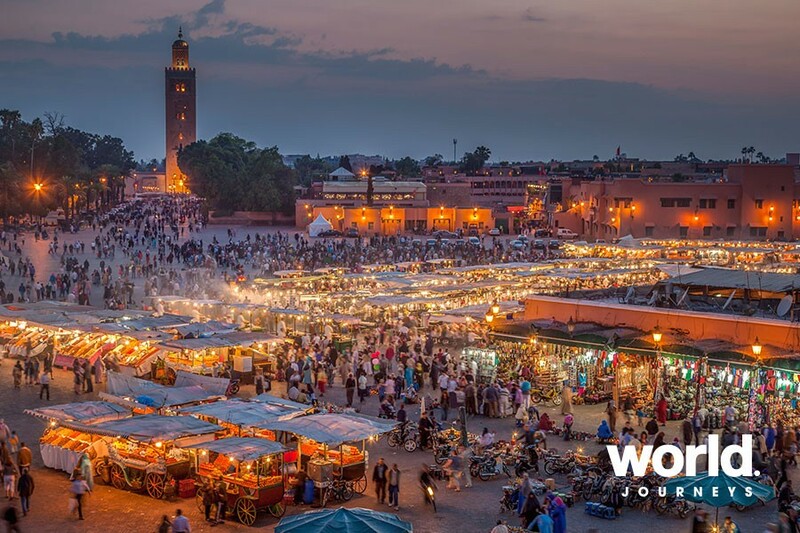 Cooking classes or other optional extras may be arranged in Marrakech for additional cost. Supplements will apply over peak periods and National Holidays. 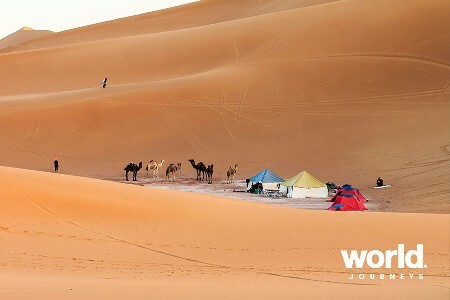 Please contact World Journeys for more information.